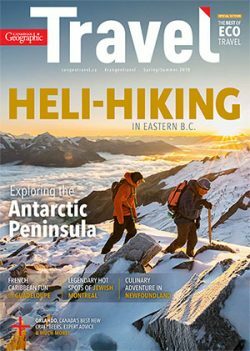 The Ottawa River Valley bills itself as the Whitewater Capital of the World, and no wonder: roiling waterways carve lifelines through the Canadian shield in every imaginable direction. It’s perhaps no surprise, then, that this Ontario region and surrounding counties are also where you’ll find the Canadian Canoe Route. Wending its way from Peterborough, two hours east of Toronto, to Ottawa, this lacework of watery ribbons is replete with opportunities to paddle whitewater as well as navigate our nation’s past, going back way before European contact. Here are seven ways to float your boat along the canoe route. 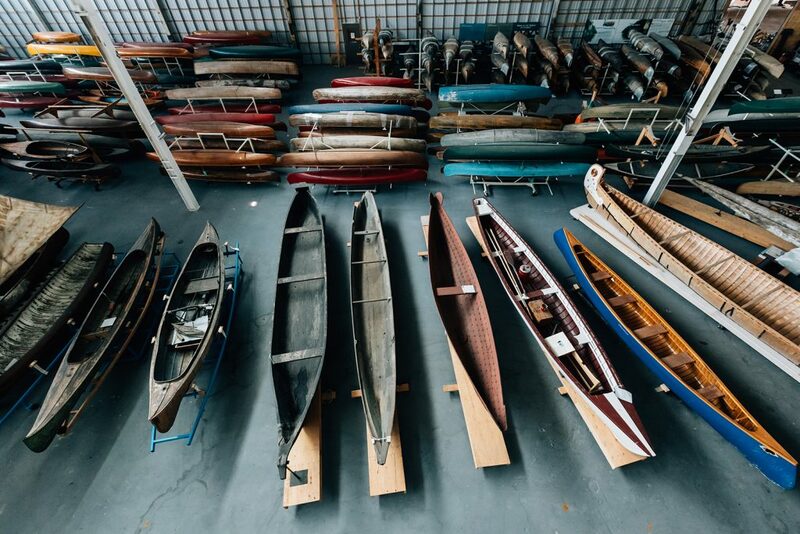 For a brief history of Canada’s original mode of transportation, head to the Canadian Canoe Museum in Peterborough Housing the largest collection of paddled watercraft in the world (the stash is so large the museum is expanding, with new digs slated to open nearby in 2020), the museum pays homage to traditional boat-building techniques by Indigenous peoples across Canada and modern craft used by today’s Olympic athletes. Check out the detailed stitching on birch-bark canoes (if you’re lucky you might catch Chuck Commanda, the master canoe builder from Kitigan Zibi Anishinabeg First Nation, and his team in action onsite); carefully carved dug-outs favoured by people on the West Coast, where cedar trees loom large over the coastline; and swift, light-weight kayaks crafted from sealskin by the Inuit. Try your hand at paddle-making with a hands-on workshop: two hours is enough to take home a model-size version; a real-size paddle will take you two days to make. The vibe at Elmhirst’s Resort, east of Peterborough on Rice Lake, is part family cottage, part family farm, complete with ducks, chickens, cattle and horses, not to mention a selection of self-propelled watercraft, including a hefty Voyageur canoe, that you can take out for a spin. If you feel like a bird’s-eye view of the shallow lake (a former marshland flooded when then the Trent-Severn Waterway was built), take to the skies in a floatplane right from the resort’s own dock. Balance your outdoor adventures with a wine tasting at the cellar, and fill up on the hyper-local food for dinner—many of the ingredients, from meat to veggies, are from the farm. But leave space for the wild-rice pudding: based on a secret recipe passed down by owner Greg Elmhirst’s grandmother, it’s a sweet nod to the local First Nations’ rice-cultivating past. Make a stopover at the Partista Espresso Bar in Bancroft for a caffeine jolt. The café uses beans from Madawaska Coffee Co., a small-batch roaster named for (and located on) the river that flows nearby. If java’s not your thing, opt for one of several loose-leaf teas, including extra spicy chai—or take in the works on display by local painters and photographers. After all, the café is housed in the artists’ co-op A Place for the Arts. Modelled on a European ski school, the Madawaska Kanu Centre was started by two German immigrants-turned-Canadian Olympic paddlers back in 1972. MKC is still run by some of the best athletes in the world. 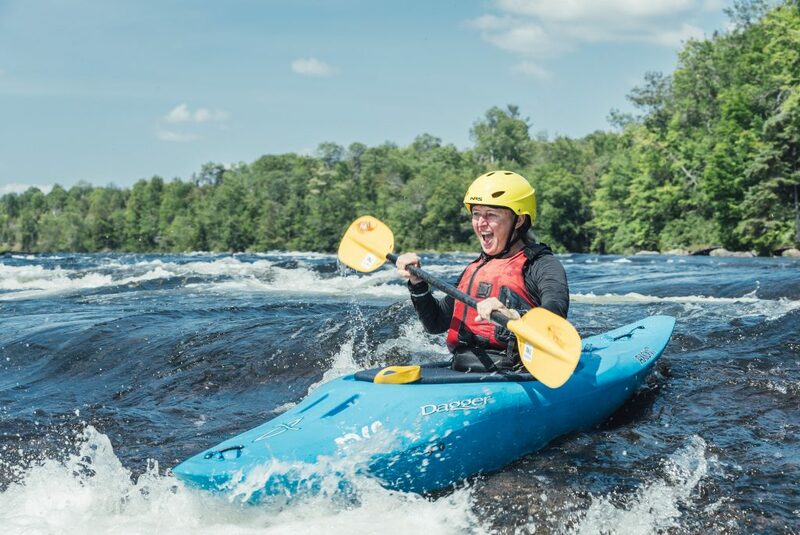 If you’re new to paddling, your instructor will show you the strokes on flat water, before moving you onto the swift currents of the Lower Madawaska River, where you learn how to plan your route and handle cross-bows and eddy turns. A wilderness resort, the centre is equipped with cozy cabanas, private lodge rooms and a dorm room, and wooded tent pads. You may bring and cook your own food. But why bother when you can dig into fully-catered deliciousness in the form of spicy lentil soup, home-baked breads, and the fudgiest brownies we’ve ever had? The Ottawa River watershed is the heartland of the Algonquin people, who have roamed its waterways and riverbanks by canoe and foot since time immemorial. Head over to Omàmiwininì Pimàdjwowin, a.k.a. the Algonquin Way Cultural Centre, in Golden Lake, for a look at the world’s largest birch bark canoe. Built in 1956 by Matt Bernard, then the chief of the Pikwàkanagàn First Nation, the boat is the centerpiece of a collection of objects and artifacts, including dance regalia and ancient stone tools, organized as a circular exhibit that follows the Anishinabe Seven Fires Prophecy. AWCC was set up in 2000 as a way for Algonquians to revive, protect and share their cultural traditions, from birch-bark canoe building to Ojibway language classes. Once you arrive in Ottawa, sign up for an immersive encounter with Aboriginal Experiences on Victoria Island. Taste traditional foods, take part in a pow-wow and test your skills at Indigenous handicrafts, all with instruction from ambassadors of the people who invented the canoe. Open from May to September, the sacred island can be accessed by paddling a Voyageur canoe from the Museum of History. Don’t even think about driving back to the GTA without having paddled at least a portion of the Rideau Canal, the oldest continuously operating canal in North America. A National Historic Site, a Canadian Heritage River and a UNESCO World Heritage Site, the 202-kilometre-long liquid ribbon is made up mostly of rivers and lakes, with only 19 kilometres being man-made canals, divided into sections by 45 locks. Rent a canoe for half a day at Jones Falls and Chaffey’s Lock, or set aside a couple of days for the opportunity to operate a traditional winch for closing and opening the locks.